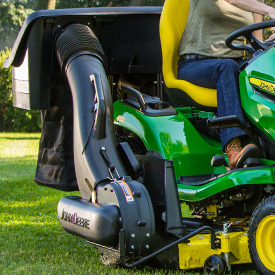 A V-twin, liquid-cooled John Deere iTorque™ Power System provides exceptional performance and has the durability to handle commercial-use applications. 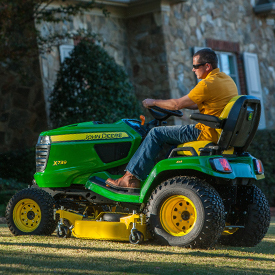 The John Deere iTorque Power System includes a combination of engine features that provide more lugging ability, even cooling, and durability. iTorque stands for intelligent design (to get a task done efficiently) and torque (good lugging ability). 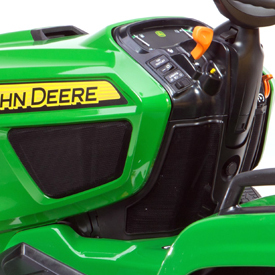 It is used exclusively on gasoline powered Select Series™ and Signature Series Tractors. 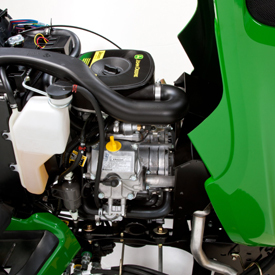 The 22-hp (16.4 kW) liquid-cooled V-twin engine has a large 45.5-cu in. 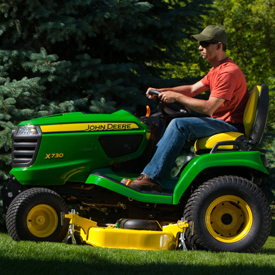 (745-cc) displacement to provide plenty of power and torque for excellent performance in any operating condition. 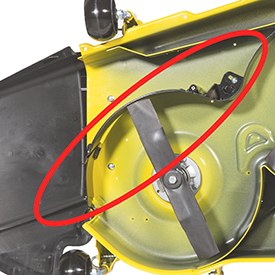 The one-piece hood is hinged to open for convenient engine service. Deep-deck design of 5.5 in. (14 cm) delivers excellent airflow, so material can be processed quickly and efficiently. Deck is stamped from 9-gauge, 0.150-in. 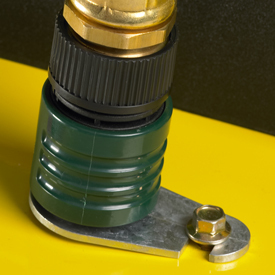 (3.8-mm) steel and has welded-on reinforcement at the bottom edge for extra strength and durability. Wider and higher discharge opening provides an even clipping dispersal for an excellent finished appearance in all conditions. 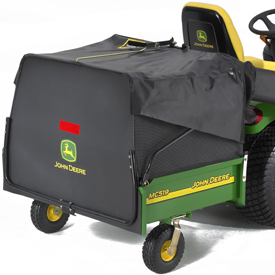 Durable plastic deflector spreads grass clippings evenly across the lawn, is hinged, and can be raised to minimize the storage space required. 1-in. (2.5-cm) cold-forged spindles are heat-treated for strength and supported by ball bearings. 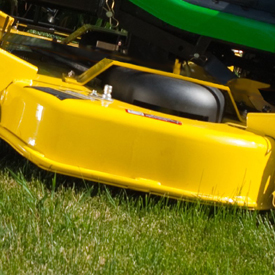 Front edge is raised above the blade plane to allow even cutting of tall grass. Blade overlap is greater than many conventional decks, for a clean cut. 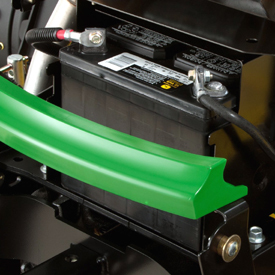 Mower can side-discharge, mulch (optional), or use a Power Flow™ collection system (optional). 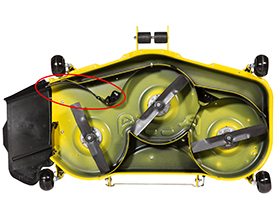 John Deere has designed a system that makes it easy to remove and reinstall the mower deck. A few steps need to be followed carefully to ensure success. The list below includes the major steps. Refer to the operator’s manual for a more detailed procedure. 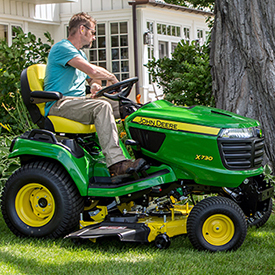 The tractor most likely has the mower already installed, so these steps begin with the removal procedure. Done! Set mower deck height and mow. 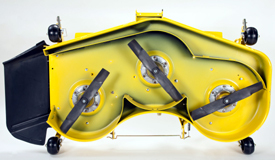 This is a high-performance mulching attachment that includes formed steel baffles to control the material and special mulching blades for superior performance. 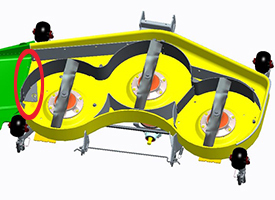 The special mulching blades that are included can also be used for side discharging and collecting, though overall performance may be slightly less than with the standard blades. 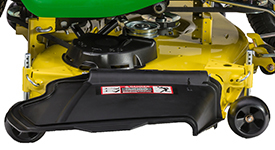 The left mower blade area is completely enclosed and optimized for mulching, thus will mulch even when the mower is in the side-discharge mode. 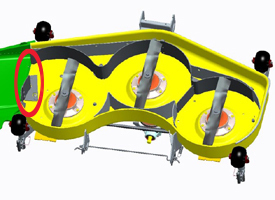 Baffles around the center and right blades are optimized for mulching when the discharge baffle is closed. 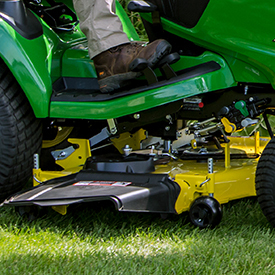 MulchControl puts the operator in control of the clippings. 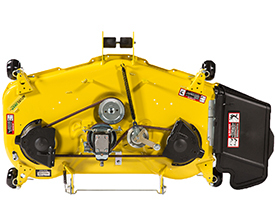 Now the operator can have all the benefits of mulching with the ability to easily change to side-discharge or bagging when needed. 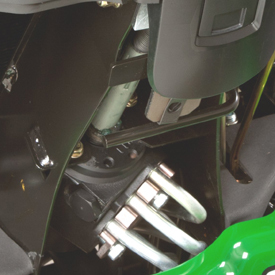 MulchControl is for 2015 and later X700 Signature Series Tractor 9074M 54-in. 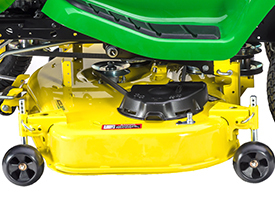 (137-cm) HC Mower Deck (SN 030,001-). 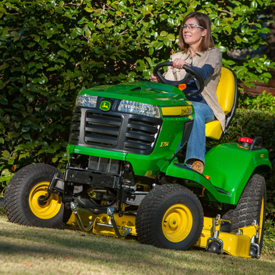 On a four-wheel drive (4WD) tractor, the operator can simply drive onto and over the deck. 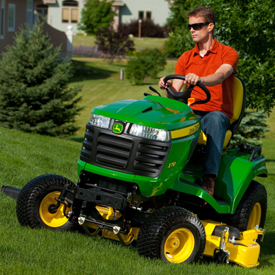 On a two-wheel drive (2WD) tractor, the operator must back onto and over the deck. 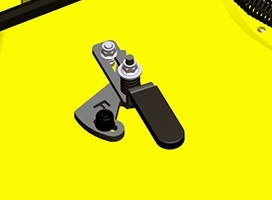 Unlock the draft arm locks. 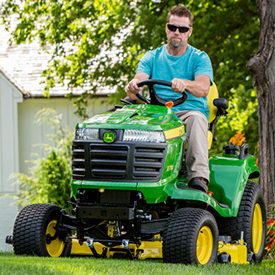 Back or drive the tractor onto and off the mower deck. 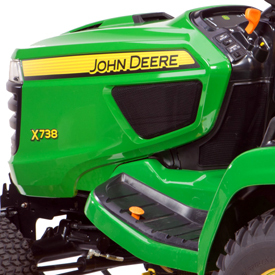 On a 4WD tractor, the operator can simply back onto and off the deck. 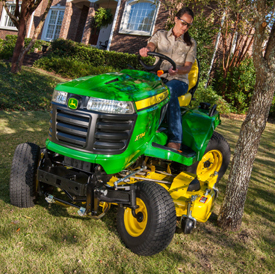 On a 2WD tractor, the operator can simply drive forward onto and off the deck. 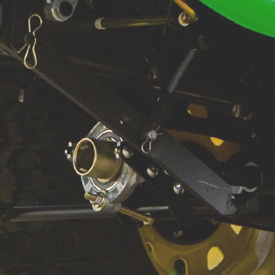 AutoConnect driveshaft is an optional kit that will automatically connect or remove the drive from the mower deck to the tractor's mid power take-off (PTO) shaft. 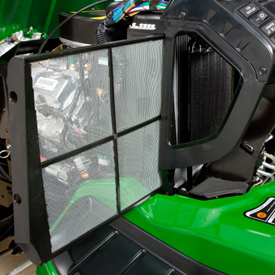 The AutoConnect drive does not need to be removed from the tractor when using front-powered equipment. Wider and higher discharge opening provides even clipping dispersal for an excellent finished appearance in all conditions. 1-in. (2.5-cm) cold-forged spindles are heat-treated for strength and are supported by ball bearings. 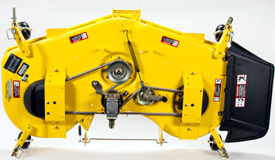 MulchControl is for 2015 and later X700 Signature Series Tractor 9075M 60-in. 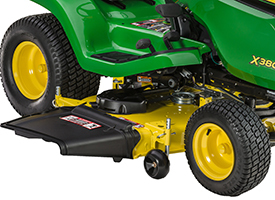 (152-cm) HC Mower Deck (SN 030,001-). 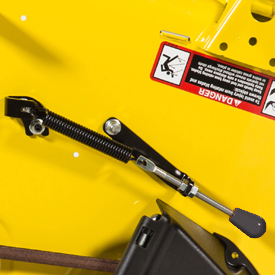 AutoConnect drive is an optional kit that will automatically connect or remove the drive from the mower deck to the tractor's mid power take-off (PTO) shaft. 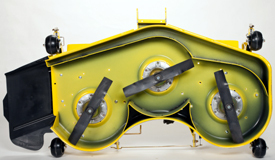 Optional MulchControl™ attachment provides superior mulching performance and versatility. 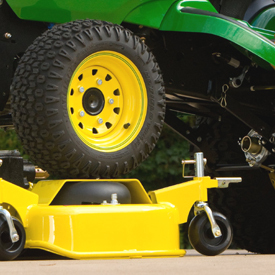 Adjustable mower wheels, positioned just above ground level, help prevent scalping. 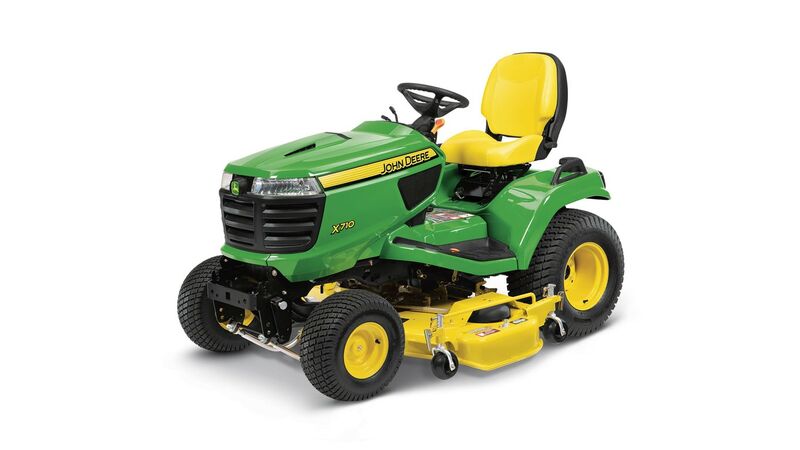 Reducing the amount of recutting enables more power to be used to cut incoming grass, which greatly improves mower capacity. 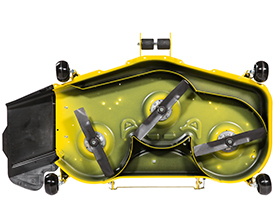 Even in mulching mode, cut evenness is improved compared to other designs because the additional depth allows for continuous circulation, optimal recutting, and an even distribution of clippings. 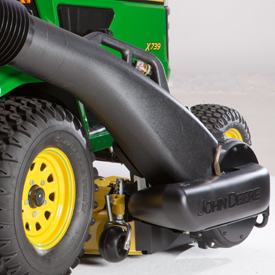 The 48A Power Flow™ blower has an inlet housing with over 50 percent greater area than the 48X Power Flow blower used on previous machines. 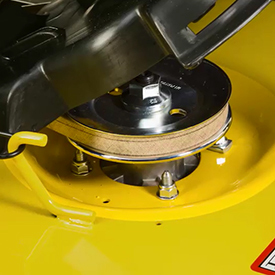 Setting wheels to the correct height for the cutting height is quick and easy. 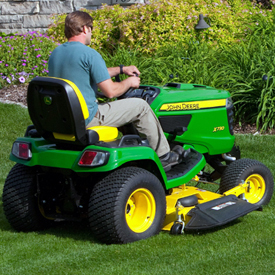 Low-tension belt-drive design reduces the side load on mower bearings for longer life. 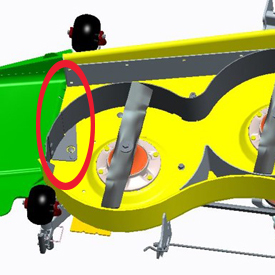 It is not necessary to change blades when changing discharge modes because the mulching blades are designed for side discharge as well. 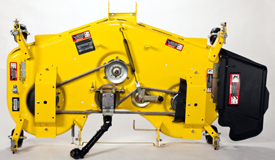 The Power Flow rear bagger can be used with the MulchControl attachment and blades installed - by simply placing the MulchControl lever in the side-discharge position. 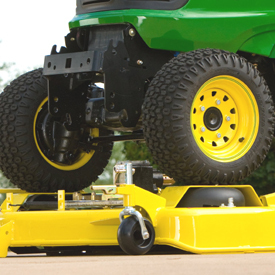 MulchControl puts the operator in control of the clippings. Now the operator can have all the benefits of mulching with the ability to easily change to side discharge or bagging when needed. 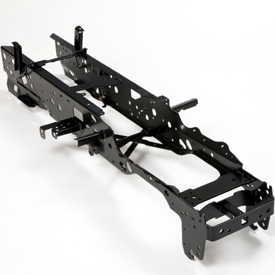 Frame side rails are formed from 7-gauge, 0.18-in. (4.6-mm) steel for extra strength. 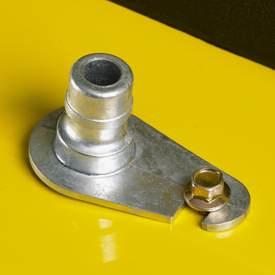 The front bumper/weight bracket is formed from heavy, 0.375-in. (9.5-mm) steel. 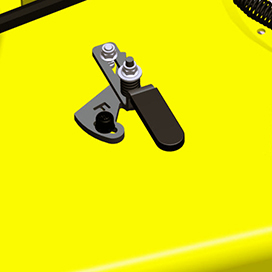 Blower is hinged to provide easy installation. Blower is easy to swing out for easy cleanout. 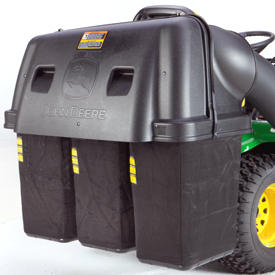 Blower fan runs in a clockwise direction (viewed from the right side) to efficiently move material up the chute. 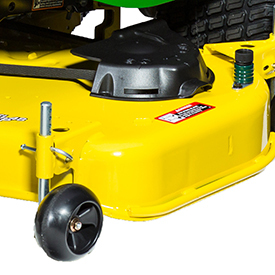 The Power Flow blower works well with either the standard mower blades or the mulching blades. 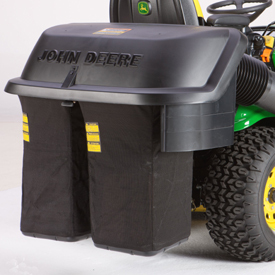 Each of the John Deere material collection systems has durable construction for long life in homeowner or commercial applications. 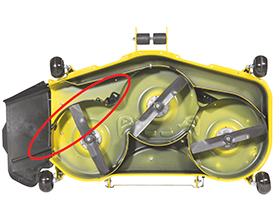 *NOTE: The 3-Bag, 14-bu (493-L) Power Flow is not compatible with a X729, X739, or X749 Tractor equipped with a 48X Mower Deck because the chute can contact the rear tire in a turn. 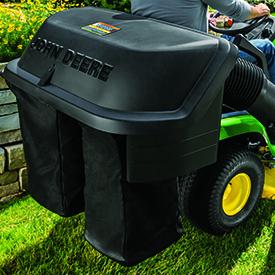 However, it is compatible with the 48 Accel Deep (48A) Mower because the increased deck height and the height of its Power Flow blower housing lift the chute high enough to clear the wheel and fender with the 3-bag hopper installed. 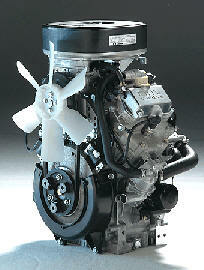 20-amp alternator is provided as standard equipment on gasoline engines. Additional alternator capacity is available as an option. 40-amp alternator is provided as standard equipment on diesel engines.